The Legend of Zelda is a famous video game series that every gamer will have heard of at some point in their life. Even if you haven’t heard of it before, with the recent release of The Legend of Zelda: Breath of the Wild, it has been impossible to miss the critical accolades the series has received. With this in mind, Viz Media has just released the first volume of The Legend of Zelda: Twilight Princess in a bid to build on Breath of the Wild’s success. The story of Twilight Princess follows a young ranch hand, Link, as the quiet life he has known until now is plunged into darkness. Long ago powerful wizards tried to take over the kingdom of Hyrule, but the Spirits of Light that inhabit the land banished these wizards to a place known as the Twilight Realm. With no way back to Hyrule, the wizards went on to build a society of their own in the Twilight Realm and until now the two worlds have lived peacefully. Now the current Princess of Twilight, Midna, is in trouble because an evil menace known as Zant is looking to take over both the Twilight Realm and the World of Light (otherwise known as Hyrule). To combat this evil a hero must rise, and that person is Link. With so much at stake, is Link really ready to fill the shoes of a legendary hero when evil threatens his world? At the center of it all, Twilight Princess is a story of good vs. evil – just as all the stories in this series are. The Legend of Zelda series always follows the concept of the hero’s journey, the friends he makes, the challenges he must overcome, and (usually) a princess in need. They’re incredibly generic stories on the surface but have a knack for being home to some fascinating lore which gives the world a real sense of depth and realism. On the whole, Twilight Princess follows this trend. Link is happily living his life in a small village known as Ordon Village until one day he begins to become aware of an evil presence nearby (it’s noted that Link appears to be sensitive to spirits and such). When children from the village get lost in the Faron Woods, Link chases after them with a search party. There he comes face-to-face with fierce monsters, and he now must fight to protect those who are important to him. In the video games our protagonist, Link, is always mute. He has no personality of his own because the developers want players to be able to project themselves onto him; to become fully immersed in the various Legend of Zelda worlds. However, mangaka team “Akira Himekawa” have built up their own version of Link throughout the years as they’ve adapted the different games into manga form, this being their tenth adaption of the series. In Twilight Princess Link is an adult: he’s laid-back and a little cheeky but also has a dark secret from his past that he works hard to hide from others. This secret is something that Link doesn’t have in the original video game simply because Link is usually not given a history (except in Breath of the Wild). This is a history and story that the team have thought up themselves and which works incredibly well. From reading this volume, it’s also clear to me that I wouldn’t want anyone else adapting the Legend of Zelda stories. Akira Himekawa have a real talent for capturing the world of Hyrule in their artwork. They put a lot of detail into the characters and the environment but it’s never overwhelming. In particular, I like the forbidding air given to the enemies; one glance tells you all you need to know about whose side they’re on! Action scenes are also drawn well and flow smoothly, and you can almost see Link jump around as you read. I think a lot has to be said for how well written this volume is too. Although there is quite a lot going on in the plot, there isn’t enough text scene to scene to put off younger readers (which some action/shonen titles of late suffer from) and makes it a welcome read for people of all ages. Less text doesn’t mean that the manga doesn’t convey emotion well either (which again some series in this genre do struggle with) as one look into a character’s eyes will usually tell you all you need to know. They’re filled with so much emotion, it’s wonderful! I have a long history with the The Legend of Zelda series but, funnily enough, Twilight Princess was my first experience with the franchise. To me, it’s my favourite Legend of Zelda game and where my love for adventure and good vs. evil stories was really born, so when I did some research into the manga’s history, I was horrified to find that this adaption was originally planned for and then cancelled many years ago. 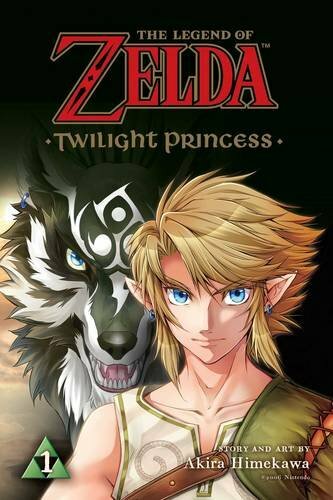 The Legend of Zelda: Twilight Princess game was released worldwide in late 2006 and the manga adaption was scheduled to be published in a children’s magazine in Japan. However, thanks to the game having a higher age rating than expected, the manga was cancelled and the mangaka team ceased adapting the games afterwards (although they did pen a story based on The Legend of Zelda: Skyward Sword as an extra in the Hyrule Historia book that Dark Horse published in 2013). Of course I wouldn’t be writing about the manga now if it had never been released and thankfully in 2016 Nintendo re-released Twilight Princess on Wii U in HD. With the general popularity of the The Legend of Zelda series also on the rise again, Akira Himekawa were finally given the chance to begin publishing their take on Twilight Princess. The manga has moved from the usual Viz Kids label to simply being under the Viz Media name. Instead of an ‘All Ages’ rating it has now been put up to a ‘Teen’ rating, but the content is still fine for younger teenagers to read. There are some mildly graphic fight scenes (although not as bad as Naruto, which is also under a Teen rating), but I think the rating jump is more down to the darker story and possibly to allow for more freedom going forward. This series is still on-going in Japan and with the second volume also penciled in for a English release, with no sign of stopping yet, it seems this adaption will be longer than any other in The Legend of Zelda series – the current longest being The Legend of Zelda: Ocarina of Time. If it does end up being three or more volumes then it’s certainly a slightly harder sell than the other Legend of Zelda books, which are mostly self contained stories, but I think it’ll be worth it in the end due to the quality of the art and the story. Overall, The Legend of Zelda: Twilight Princess Volume 1 shows promise. The story has been well adapted to manga and still gives me the same sense of enjoyment that 11-year-old me got from playing the game for the first time. I just hope that this story can inspire the same desire for adventure and fantasy stories in young readers today as it did for me, as it truly is something special. It’s a real treat for Legend of Zelda fans of all ages and newcomers or veterans to the series. A man with the power of mochi and a gigantic wedding cake are on the menu as the current arc of One Piece nears its conclusion. Railgun’s humour is still better that that of Index, but also there is some added drama to the mix. On the surface Dragon Goes House-Hunting may seem like an odd concept, but what we have here is a charming story about what it means to look for a new home.